VANCOUVER, BC, February 24, 2014 – Mirasol Resources Ltd. (TSX-V: MRZ, Frankfurt: M8R) is pleased to provide an exploration update for its 100% owned Rubi porphyry copper-molybdenum-gold project that is being explored under JV by copper miner First Quantum Minerals (First Quantum). 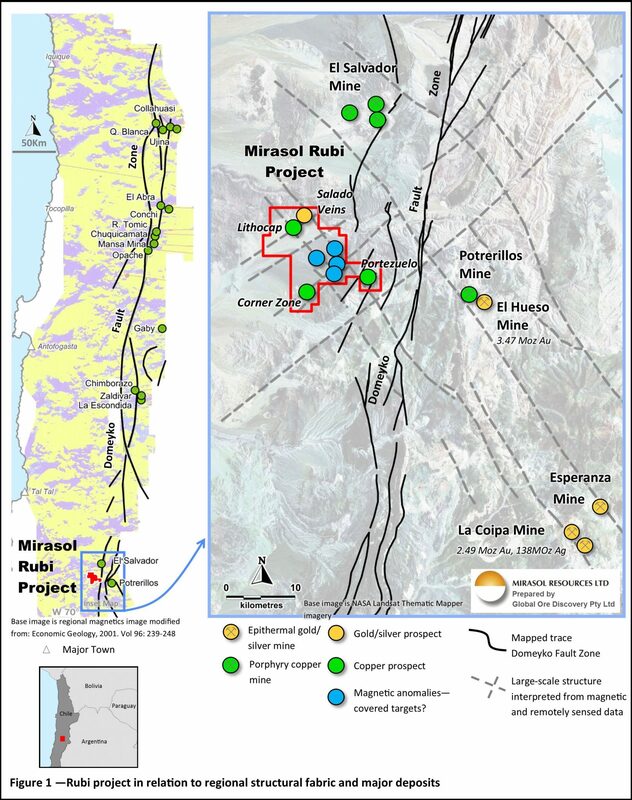 The Rubi project is located within the prolifically mineralized Eocene – Oligocene age porphyry copper belt of Northern Chile (Figure 1) which hosts some of the world’s largest copper mines, including the La Escondida, Chuquicamata and Collahuasi mining districts. Rubi is centered within a district-scale cluster of these copper deposits, lying 16 km south of the historic El Salvador mine and 12 km west of the Potrerillos mine, both of which contain low-level gold mineralization. In the case of Potrerillos, it also has associated peripheral, epithermal mineralization that has produced stand-alone gold mines (the El Hueso district). Rubi is subject to an earn-in JV agreement (see news release September 18, 2013) with First Quantum that requires a minimum exploration expenditure commitment of US$1.5 million within the first year anniversary of the signing of the Definitive JV agreement. This includes a minimum exploration commitment of a project-wide magnetic geophysical survey and 3,000 m of drilling. In the fourth quarter of 2013, First Quantum commenced an aggressive exploration program at Rubi under the terms of a binding letter agreement, which allows for pre-drill surface exploration (mapping, sampling, geophysics) to be advanced while legal counsel for the Company and First Quantum work to finalize the Definitive JV agreement. Exploration completed to-date includes a 2,460 line-km, detailed, low-altitude, helicopter-borne magnetic (helimag) survey covering the entire Rubi project and immediate surrounding lands. Additionally, property-wide geological mapping and rock chip sampling of the project was completed, confirming the prospectivity of Mirasol’s Lithocap, Corner Zone and Portezuelo targets. Orientation soil sampling was also completed at the Lithocap prospect and gravel-covered extensions to determine the best sample and analytical techniques for a project-wide soil sample program planned for early 2014. Mirasol has undertaken an initial interpretation (Figure 1) of the preliminary helimag images in the context of other publicly available regional magnetic surveys and satellite imagery. This confirms that at a regional-scale the Rubi project is located in a geologically permissive setting along the Domeyko Fault Zone (DFZ), an important continental-scale north-south oriented fault system that is recognized as the primary control on all the large Eocene – Oligocene age porphyry copper districts in northern Chile. At the district-scale this interpretation further shows that the El Salvador and Potrerillos copper mines, as well as the Rubi project, lie where the DFZ is intersected by large-scale northwest- and northeast-oriented faults. This style of structural intersection is recognized by Mirasol as an important control localizing porphyry mineralization in many of the known mining districts in northern Chile. The helimag interpretation confirms the presence of splays into the Rubi project from these large cross-cutting faults which appear to be the continuation of a prominent fault associated with the multi-million ounce La Coipa silver-gold mine located 30 km to the southeast. In detail, the Rubi helimag shows magnetic anomalies at the Portezuelo and Lithocap prospects that are consistent with large-scale alteration systems and may suggest previously unrecognized extensions of these prospects under gravel cover. Additional magnetic anomalies, evident through the gravel cover, in the Pampa del Inca plain may represent new exploration targets. The planned First Quantum exploration program beginning early 2014, will include interpretation and targeting of the final processed helimag data and sampling of an extensive project-wide soil survey, to test for extensions of known prospects and explore the extensive gravel covered areas of the project for unrecognized, concealed targets. Detailed mapping, alteration-vector studies and rock chip sampling of the known prospects will also be undertaken to refine drill targets during this period. Orientation testing of various electrical geophysical techniques is planned to identify the optimal techniques for use at Rubi for systematic geophysical surveys over the target areas. Mirasol Resources is pleased to have partnered with First Quantum Minerals to explore the Rubi project. First Quantum Minerals have shown a significant early commitment of resources to the project and are demonstrating a systematic and thoughtful application of modern exploration methodologies that Mirasol believes will enhance the potential for exploration success. Further exploration updates will be provided by Mirasol as significant technical milestones are delivered along the path to first drill testing of the Rubi project. Stephen C. Nano, Vice President of Exploration for Mirasol Resources, is the Qualified Person under NI 43-101 who has prepared and approves the technical content of this news release. Exploration at the Rubi Project is supervised by Stephen C. Nano, Vice President of Exploration, who is the Qualified Person under NI 43-101. All technical information for the Company’s projects is obtained and reported under a formal quality assurance and quality control (QA/QC) program. All drill, rock chip and stream sediment samples are collected under the supervision of Company geologists in accordance with standard industry practice. Samples are dispatched to an ISO 9001:2000-accredited laboratory in Chile for analysis. All drill, rock chip, and stream samples are submitted to the Laboratory with independently sourced, accredited standard and blanks and where appropriate duplicate samples to facilitate monitoring of laboratory performance. Certified Results are examined by an independent qualified consultant to ensure laboratory performance meets required standards.